DECOBIKE, LLC is a developer and operator of public bicycle sharing systems and programs for cities and institutions. Bike Sharing is an emerging industry that is revolutionizing the way people commute each day by utilizing public-use bikes for short local commutes. Ideal for urban settings and easily integrated with existing public transportation, DECOBIKE's programs help eliminate the need for an automobile around the city. Using state of the art technology, the DECOBIKE stations are solar-powered and use wireless communications for payment processing and access control. Program bikes are very rugged and custom-tailored for harsh outdoor conditions. 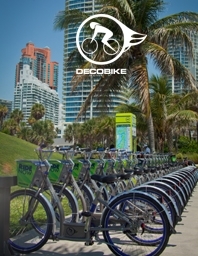 DECOBIKE is the Official Bike Sharing Program of South Beach and Miami Beach, Florida as well as Long Beach, New York and Surfside, Florida. Contact DECOBIKE today for more information.